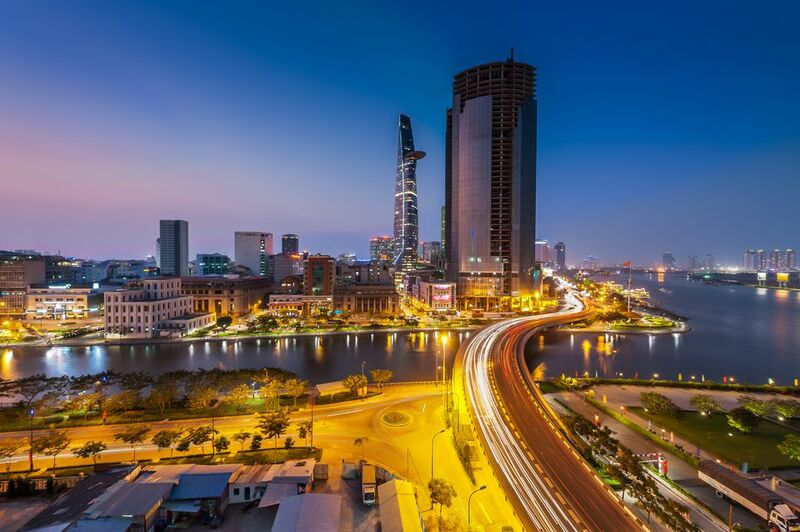 Saigon is a pulsating metropolis that’s well on its way to becoming one of Asia’s urban hotspots. It holds its own competing with the likes of Bangkok, Singapore, Shanghai and Hong Kong in the Asian city break stakes, offering chic bars, great shopping and one of the world’s most delicious cuisines. Here’s how to make the most of a weekend in Saigon, taking in the best of the sights with a healthy dose of eating, drinking, and shopping (the obligatory triumvirate of any Asian mini-break!). Check in to your lodgings of choice and get primped for a night out, Saigon style. Centrally-located options include the Park Hyatt (compare prices) or Sheraton (compare prices) if you have the budget to spare. The 4-star Duxton (compare prices) is a great choice offering a comfortable stay for a little less outlay, while a friendly, reliable mini-hotel (if you don’t mind that faded 70s look) is the Kim Long Hotel, just off main thoroughfare Dong Khoi Street. For a pre-dinner drink in a buzzing setting, head to ZanZbar (41 Dong Du). A low-lit bar with a contemporary design and friendly atmosphere, ZanZbar has an extensive drinks menu with some great cocktails (try the Lemongrass Collins), and a menu of delicious mod-Asian bar snacks. Saigon’s restaurants offer a multitude of cuisines, but Vietnamese food is no doubt at the top of your agenda. For a more refined introduction to Vietnamese food, Hoa Tuc offers a great selection of local dishes in a chic setting. It is situated in the grounds of The Refinery (74 Hai Ba Trung), a little enclave of restaurants and bars which originally served as an opium refinery. Dishes at Hoa Tuc are mostly in the US$5-6 range and run the gamut from fresh Vietnamese salads to seafood. You can opt to end the meal with Vietnamese inspired ice-cream with flavors such as ginger or young rice. If more drinks are in order, head to nearby Caravelle Hotel’s Saigon Saigon Bar (corner of Dong Khoi and Lam Son Square) for one of the best views of the city lights, or cross the road to funky Q Bar for a nightcap beneath the Opera House. Resist the lure of the shops and cafes (for now!) by visiting some of Saigon’s most famous sites, the Reunification Palace and War Remnants Museum. If walking from a hotel in the center, take a sojourn along famous Dong Khoi Street until you reach the Notre Dame Cathedral, which is flanked by the historic central post office to the right. After a little detour here, keep going to The Reunification Palace (106 Nguyen Du) - the scene of the fall of Saigon and end of the war - you can take a guided tour of the retro-furnished rooms. If still in history mode, head to the War Remnants Museum (28 Vo Van Tan, District 3) for a fascinating, if disturbing, display of photographs and other war memorabilia. You’ll definitely be in need of a strong coffee by now (probably of the iced variety after all that traipsing around in Saigon’s steamy heat), so head to Trung Nguyen behind Diamond Plaza (34 Le Duan). An outlet of a famous Vietnamese coffee brand, this cafe offers tables in the shape of Vietnamese coffee drippers and a selection of brews from the country’s premier coffee growing region, the Central Highlands. The smoothest variety is Legendee, produced using digestive enzymes from a local civet or weasel — it definitely tastes better than it sounds! For a cheap and cheerful Vietnamese lunch, head to Quan An Ngon (138 Nam Ky Khoi Nghia). It's likely to be crowded (usually with rowdy local families) but the food is still worth the wait. The restaurant was set up to house the best street vendors from around the country, each renowned for their particular dish. You can walk around the restaurant grounds to see each cooking station in action. Must-tries on the menu are the beef with chili salt and the lemongrass clams. Dishes here are very good value, averaging US$2-3. To walk off the feast, head to shops nearby, between Le Thanh Ton and Le Loi, around the cross-streets Pasteur and Nam Ky Khoi Nghia. This is a great area for clothing, embroidered textiles, homewares, and accessories. Check out Ipa-Nima (at 85 Pasteur, or at the new branch at 77-79 Dong Khoi), a colorful handbag emporium home to highly creative and unique bags and wallets. For an afternoon cafe stop, head up a dingy stairwell to La Fenetre Soleil (135 Le Thanh Ton), a bohemian, vintage-look space with high ceilings, a chandelier, large French windows and mismatched furniture. Try their ginger juice for something refreshing, or the Vietnamese coffee-flavored French toast while lounging on a sofa or the canopied daybed. Start your Saturday night out with a drink at Temple Club (29 Ton That Thiep), a place with the ambiance of a stately gentlemen’s club. Upstairs is Quan Nuong, an excellent place for Vietnamese barbeque. Here, you cook your own food in the center of your table, the prawns arrive alive and the beer is topped off with ice — it offers a fun, local experience, and the food is delicious. Amber Room (59 Dong Du) is a chic new late-night haunt for drinks in an intimate space, backed by cool tunes. Try the signature basil martini for something Vietnamese inspired. A late start is in order, so head to Au Parc Cafe (23 Han Thuyen) for a leisurely brunch. The high-ceilinged European style cafe offers fresh juices and breakfasts ranging from typical western combinations to the Middle Eastern-inspired; all have a healthy bent. Take a trip to the famous Ben Tanh Market if you have the energy to spare. Have a quick look around (but put your best bargaining skills to use) and check out the interesting food stalls. For lunch, Tib Express (54 Phan Boi Chau) is a cool, contemporary Vietnamese restaurant located across the road, with a great selection of fresh and cheap Vietnamese spring rolls. For some last minute retail therapy, head to Saigon Kitsch (43 Ton That Thiep). Here you can pick up colorful, kitschy notebooks and drink coasters, or propaganda art from Dogma upstairs for a fun souvenir of your Saigon stay.